A good portion of the United States is under a blanket of snow at the moment but that doesn’t mean you have to stop driving. Sometimes you gotta hop in your older brother’s Honda CR-V and whip it around the empty cul-de-sac a few streets over while you “learn” how to drive in the snow. 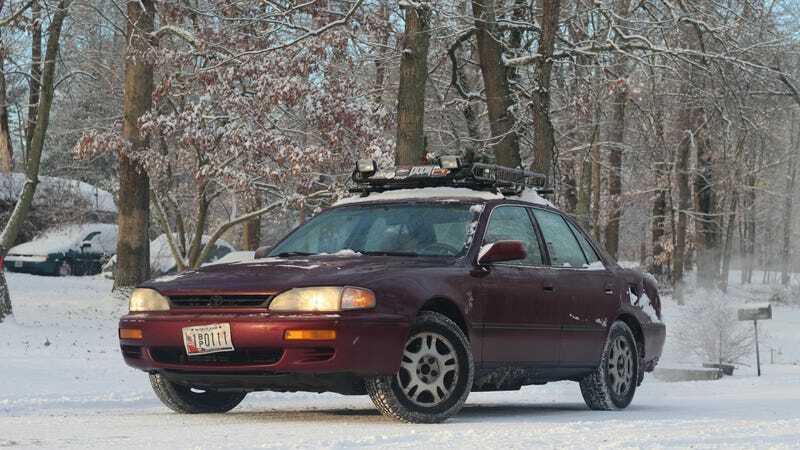 Everyone needs a winter beater car that will get you through the cold months. My winter car is also my daily driver. It is my 1996 Toyota Camry. This Toyota thrives on negligence and I rely on it everyday to get me where I need to go. It’s only gotten me stuck several times. In fact, the bent front license plate is from an ill-fated meeting with a mound of snow in the corner of my college’s parking lot. But the engine fires up every time I turn time I turn the key so I can’t complain. So what do you drive when the temperature drops and you need something a little more hardy for the winter? Show us what rides you rely on to brave the snow.